Pros Beautiful papercraft world and game aesthetics • Interesting collection of characters	Cons Level design is uninspired and unchallenging • Characters move a bit too slowly • Controls sometimes get wonky when two characters are close to one another. One look at the trailer and screenshots and it is hard to resist the temptation of the beautiful papercraft world that Blitz Games Studios has created for their newest game Paper Titans. The Collector – is in charge of grabbing the three stars spread about in each level. 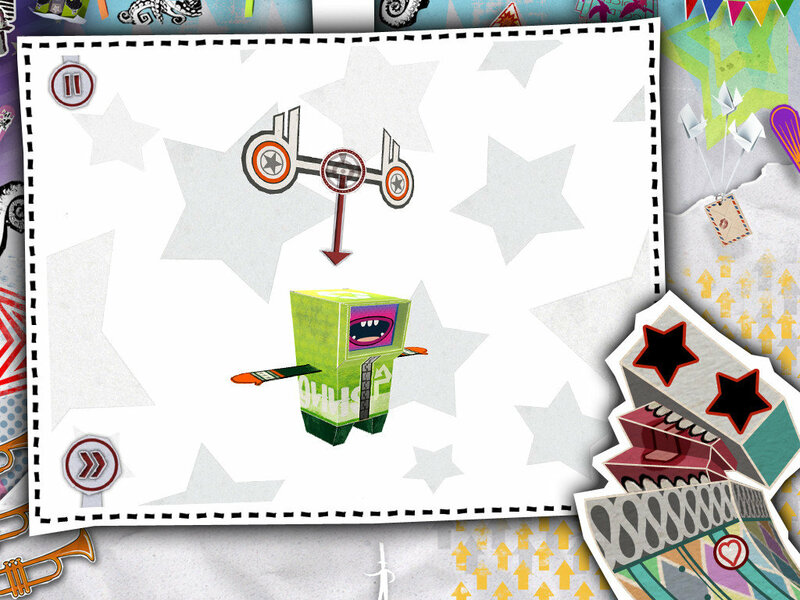 In each of the game’s 45 levels, you are allocated a certain number of titans (of varying count and type) and you must utilize them the collect the three stars spread about the level and reach the “air mail” being held aloft by a flock of cute origami birds. Selecting a titan from your inventory will cause him to fall down into the screen, dust himself off and be ready for action. The locations on the level where the different titan types can perform their special abilities are clearly marked and it is just a matter of dragging a path from the titan to that destination and the selected titan will lumber over to that spot (I wish they’d move a little bit faster). For the most part the controls work fairly well. However, when two titans are really close to one another, it can sometimes be a little bit of a struggle to make sure you are moving the correct one (especially on the smaller iPhone screen). Unfortunately this situation arises fairly often since some titans have to interact with others to perform their action. For instance, you have to drag other titans onto the Thrower to get him to toss them up to higher elevations. The world that Blitz Games Studios is gorgeous to look at and interact with. 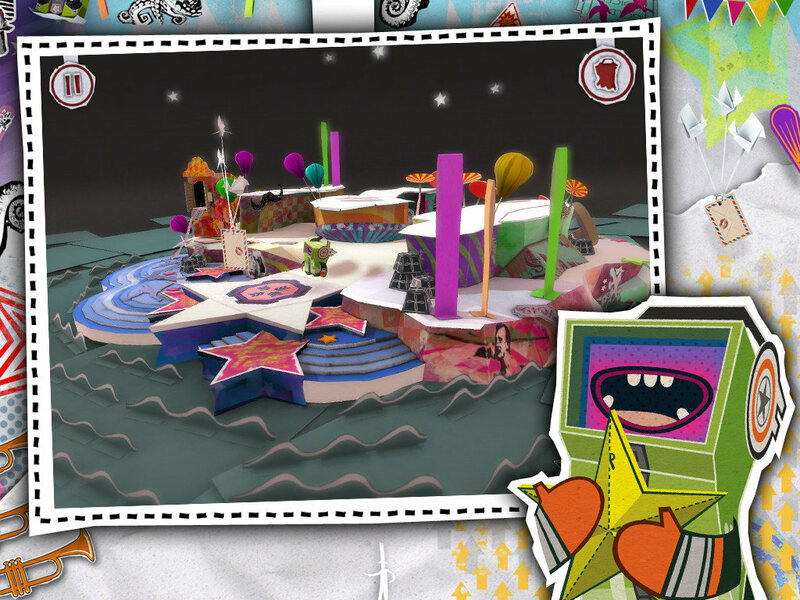 The animation throughout the game is quite beautiful to watch and I found myself pinch-zooming and spinning around the landscape solely to get a closer look at all of the fine details crafted into this whimsical paper universe. Obviously a lot of work has gone into this particular aspect of the game by some very skilled artists. Each time a new character is introduced, you get to virtually fold him right on the screen. A neat little touch to say the least, plus there are links to print out the physical versions of the papercraft characters as well for some analog entertainment. While the aesthetics are phenomenal, where Paper Titans really falls flat is in the level design. In nearly every level you are given plenty of resources, completely removing any decision-making or strategizing and basically you just end up going through the motions to grab the stars and complete the level without any thought whatsoever. There were glimpses of hope on the handful of levels where you had just enough resources to complete levels and a wrong choice could leave a titan stranded, unable to collect all three stars. Unfortunately these were few and far between. 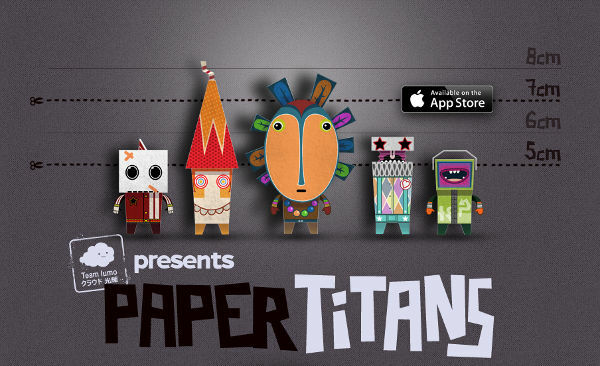 Paper Titans has nearly all of the elements of a truly great puzzle game: cute characters with varied abilities, an amazing art-style and interesting game mechanics, but there is just nothing puzzling about it. The levels are bland and easily solvable with little to no forethought, which is truly a shame given the stellar artwork. The development team needs to revisit their level design and rework all of the levels to add an element of challenge and strategy. If they can do this, they could completely turn the game around, otherwise it’s merely another unfortunate case of style over substance.